Tiger Hill Pagoda stands on the Tiger hill's summit and is the Pagoda of the Yunyan Temple. 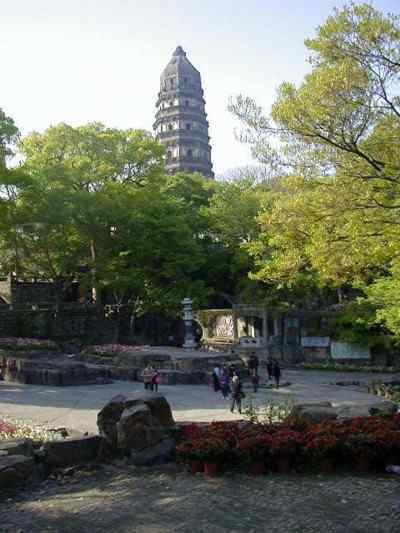 As the oldest pagoda in the vicinity of Suzhou it has come to be a symbol of the city and has the distinction of being China's Leaning Tower. Built during the Northern Song Dynasty (959-961) it is a seven-storey octahedron after the style of the timber pagodas built during the early Tang period. It is 48 metres high (158 feet) and for the past four hundred years has leant 359' to the northwest.